It literally took the cookies longer to bake than make. And they only take 10 minutes to bake. The Kid is kind, softhearted, and funny (although my child’s mortified when this news leaks). It all goes against the carefully cultivated image of a cranky old man, shaking his fist at neighborhood children who venture too near his yard. I’d made some lemon cookies for The Kid, who was joining us for dinner. But they weren’t Petey’s thing, so I texted our offspring, to grab something sweet for Daddy on the way over. I didn’t hear back, but I hardly ever do, so I just assumed that our conscientious child would deliver. Only, The Kid either never received the message or forgot to procure. I’m not entirely sure which; my spawn was a little fuzzy on the details. But the upshot was, there was no dessert for Daddy. The Kid was distraught. Our child was all set to miss dinner to get him something when I had a thought. It was a thought about my kitchen crush; Alton Brown. I’d been reading the October issue of Food Network Magazine. And within its pages was an Alton recipe for peanut butter cookies. But it was as stripped down as an abandoned Cadillac in a sketchy part of town. It didn’t even have flour, for heaven’s sake (which means they’re gluten-free). Regardless, they were a hit. So thank you Chef Brown. Call me maybe? Heat oven to 350. Line 2 cookie sheets with parchment paper and set aside. Alton mixes by hand, but at this point I just dumper everything into my mixer bowl and mixed until it just came together. Roll dough into 1-inch balls. Place 6 on each pan, and flatten with the tines of a fork making the traditional cross-hatch. Bake for 10 minutes, or until the cookies look dry and are lightly browned around the edges. Let cool on pans for 2 minutes then place cookies and parchment onto racks until totally cool. I tried rolling the balls in dark cocoa powder to give them a hit of chocolate. It didn’t really flavor them, but when baking the cookies got an interesting pattern of black with light brown peeking through. Before baking, I added orange gel food coloring into the dough until it was bright orange. I made the cookies about ¼ the size of the originals. After they baked and cooled completely, they looked very Halloween-y. I then made a batch of the marshmallow frosting that I talked about a few weeks ago. Using the frosting I made cookie sandwiches. They’re pretty good right away, but if you make them, cover them, and let sit overnight, the frosting sets up, and won’t squish out the sides when you take a bite. These littles cookies are very similar to a sandwich I’ve heard about. 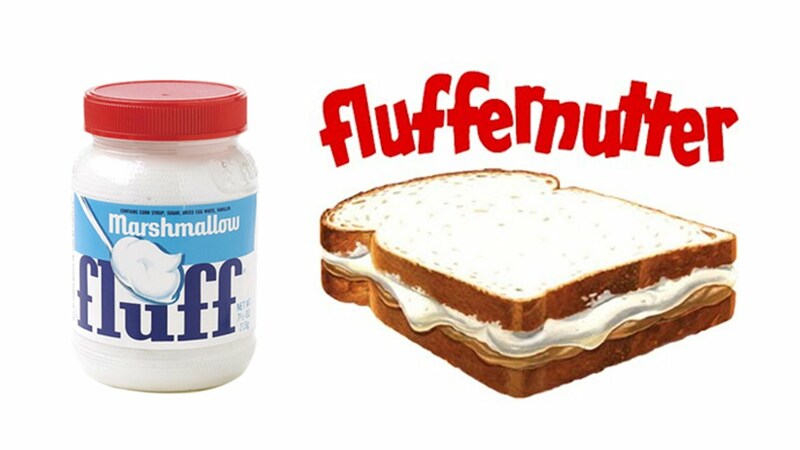 Called a fluffer nutter; it’s marshmallow fluff and peanut butter on spongy white bread that was created in New England in 1913. Which is pretty horrifying. But if you don’t have the sandwich ingredients on hand for the small fry, you could give them approximately the same nutritional benefits by having them dine on cotton candy and gin (Of course, that’s assuming you always have cotton candy and gin in your kitchen–but who doesn’t? Amiright?). ← A baking lesson, plus there’s pie!